Tempera, gouache watercolour and collage on canvas, 93 x 106 cm, 1982. 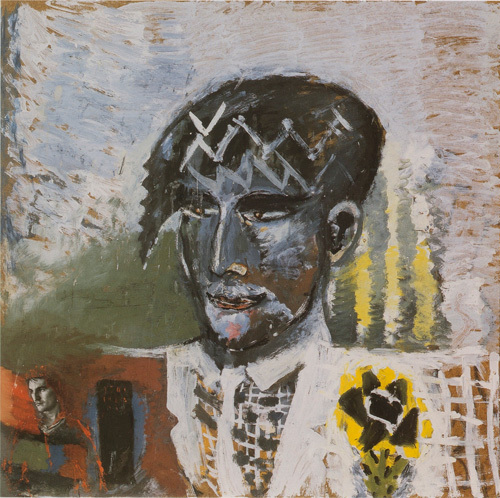 Tempera, gouache, watercolour, collage on canvas, 93 x 106 x 5.5 cm, 1982. The painting has been lost. Несомненным недостатком выставки «Грани портрета» была установка на жанр: портрет вообще, голая схема — вот и все. Единичны работы, изобразившие конкретных людей (не о женах, разумеется, речь), само существование которых и есть существование второй культуры. В этом смысле весьма ценны работы Дмитрия Шагина и Тамары Валенты. Портреты А. Эндера работы Владимира Михайлова и Александра Малтабарова, портрет Тимура Новикова работы Е. Козлова и К. Хазановича, портрет Бориса Лихтенфельда работы Корсавиной — не слишком ли этого мало для выставки нонконформистов с таким названием? 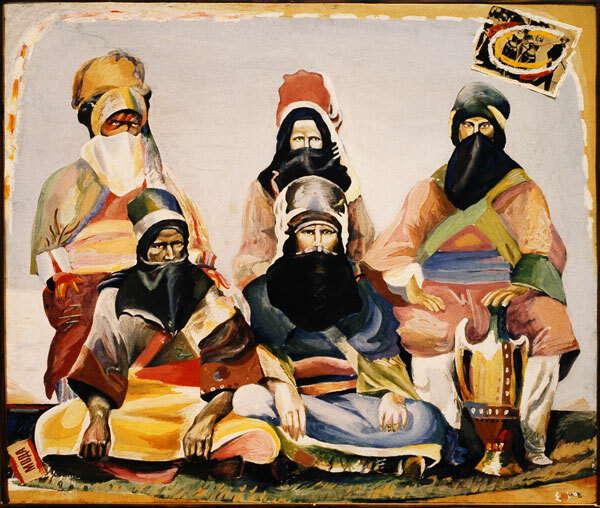 Tuaregs: Diary page 3-59 >>, Diary page 3-78 >>. Both works are exceptionally important in his search for a new style. 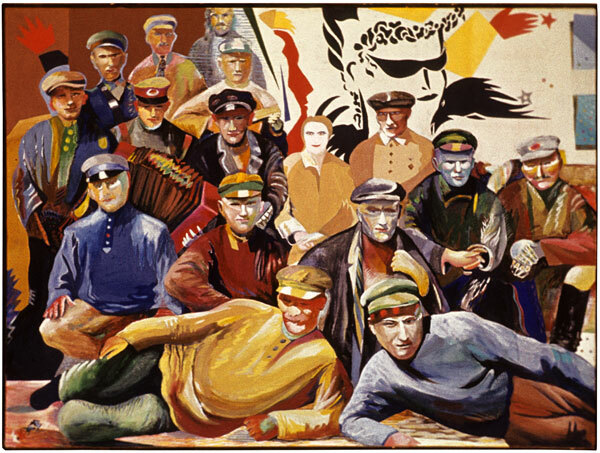 E-E-183001 Комиссары / Kommissars Tempera, gouache watercolour and collage on canvas, 93 x 128 cm, 1983. First title ‘Музыканты / Musicians˚ (Dairy page 3-80, dated 27. 1. 83), title as of 2. 2. 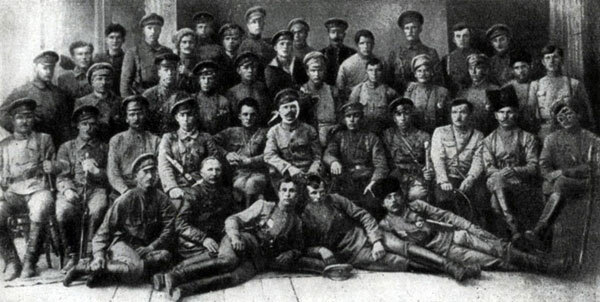 1983 (Diary page 4-03): ‘В ударных бригадах были свои музыканты’ / ‘The Strike Brigades Had Their Own Musicians.’ Last title ‘Комиссары / Kommissars‘. The black-and-white picture shows the work in progress, presumably January 1983. The finished work shows considerable changes with regard to the original composition. 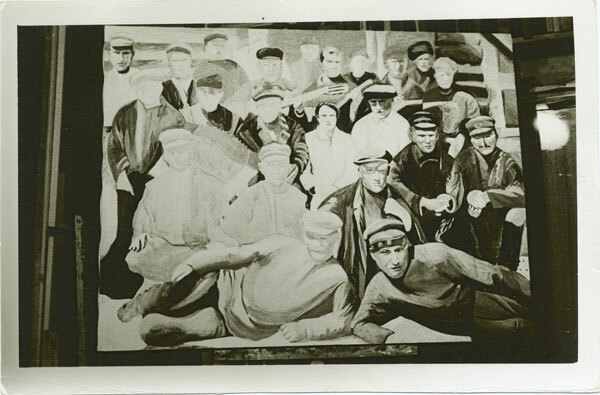 A number of figures in the background have been removed in favour of what E. Kozlov defined as ‘Искал и нашел новые способы выражения‘ / ‘I searched for and found new ways of expression’. The light movement of the two faces and waving hands are in striking contrast to the frozen poses of the commissars. Their sharp outlines were probably done with the help stencils, a technique also used in E-E-183022, ‘Sit venia verbo Традиции ХХ века / Sit venia verbo. 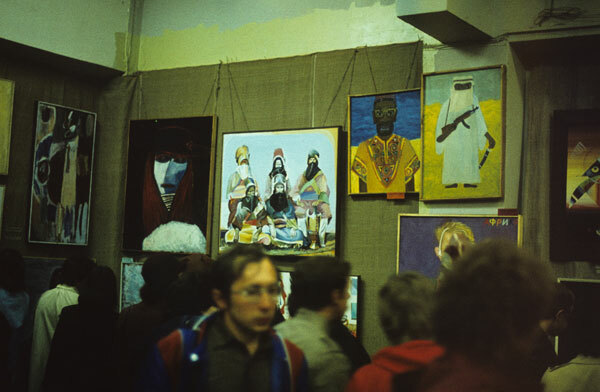 Traditions of the 20th Century' (Diaries, page 3-77 >>, also >>), and its corresponding work E-E-183022, the poster for the exhibition at the Palace of the Youth (April 1983) >>. Another new feature is the self-portrait of the artist: in the traditon of old masters such as Velazquez, the artist introduced himself into this group portrait. 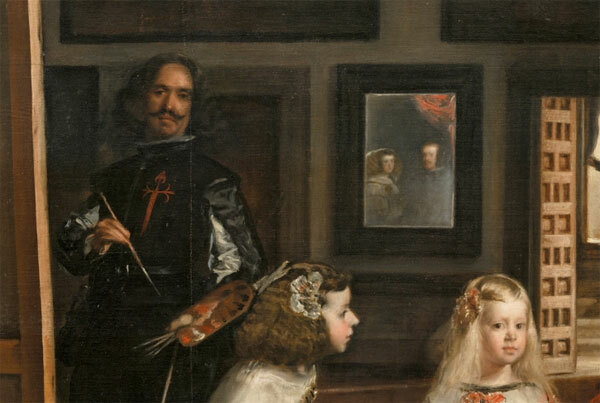 With his long hair and beard he is, indeed, similar to Velazquez in his painting ‘Las Meninas’ from 1656. But Kozlov's appearance at the very back and the soft expression of his face allow for a different interpretation. He stands there Christ-like, representing a different world, of which the strong-willed commissars with their stern faces take no notice. Diego Velázquez ‘Las Meninas‘, 1656. Detail with the artist's self-portrait. 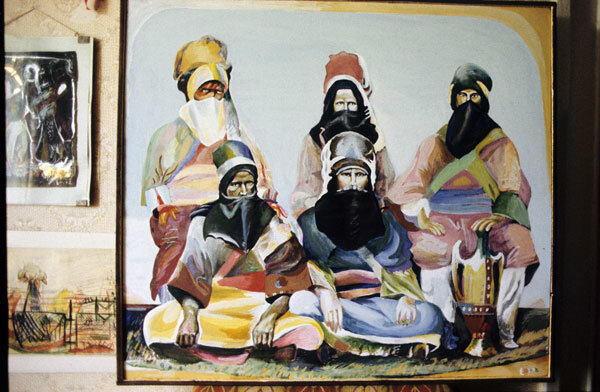 The portrait was painted in 1984 at Timur Novikov's studio and gallery ‘ASSA‘ on Voinov Street. To the right is a sculpture by Ivan Sotnikov (?). 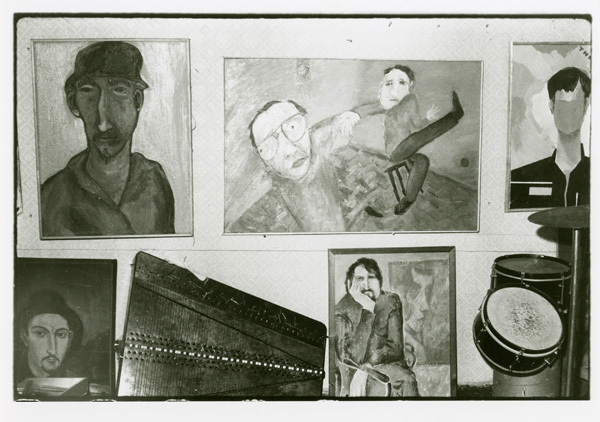 The two black-and-white pictures by E. Kozlov were also taken at gallery ‘ASSA‘, most probably during the exhibition called ‘The Third Biennale of Timur Novikov's Portraits (autumn 1984). 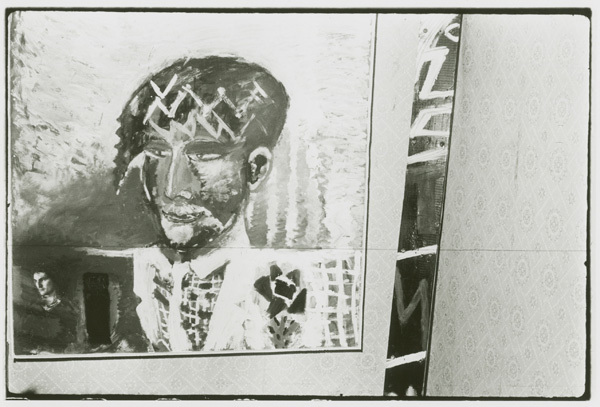 Whether this exhibtion took place before or after Грани Портрета / Facets of Portraiture remains uncertain. 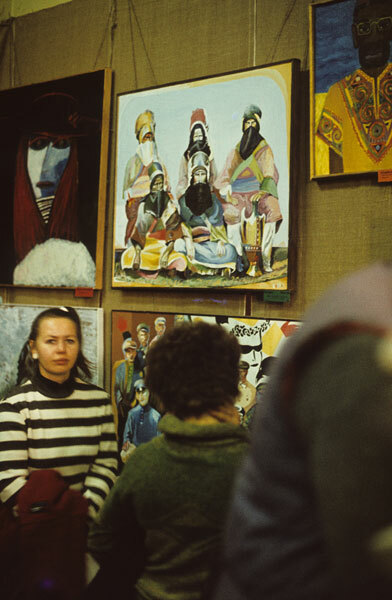 (E-E) Evgenij Kozlov's picture from his photo-shoot ‘Fashion Show’ at gallery ‘ASSA‘, end of 1984.